THE WARRANDYTE Cricket Club has had a much-improved November, allowing all squads to increase their standings heading into the final month of the year. The 1st XI have put their first win on the board for the year in Round 5 against Montrose thanks to Ben Taylor, who scored back-to-back half centuries throughout the month, placing himself at the front of the runs sheet for the club. Taylor, who led the way with 68, was supported well by the Poole brothers, with Brady (3/39) doing damage with the ball, while Darcy (28) assisted with the bat. Despite a severe middle order collapse by the team, 161 runs was enough for Warrandyte, with Montrose bowled out in the final over to finish four runs short. Round 6 placed Warrandyte in a matchup against a top tier South Croydon, and a rain-affected tie gave Warrandyte the chance to take points off a strong team. After a shortened day one, Warrandyte knew South Croydon would be declaring early and attempting to bowl them out by 7pm. Warrandyte, facing a very strong bowling attack looked steady in both the run chase and time management, until some late wickets looked to dash the hopes of a tough draw. However, 14-year-old Brady Poole would heroically face 57 deliveries and survived the entire final over with Warrandyte nine wickets down to earn the draw, and give Warrandyte what could be a golden four points come the end of the year. Round 4: Warrandyte 127 (Taylor 52) def. by South Croydon 8/206 (Killey 4/25). Round 5: Warrandyte 161 (Taylor 68) def. Montrose 157 (B Poole 3/39). Round 6: Warrandyte 9/139 (Williams 50) drew with South Croydon 6/230 (White 3/36, Killey 3/79). The 2nd XI had an entertaining November, but unfortunately were unable to take a win from the three games. Blooding some exciting youth in the team, including Bailey Bowyer, Ben Jackson and Chris Rakuscek, the team have been very competitive in all games, but unable to scrape together their second win for the season. In their Round 5 game, Warrandyte would fall just 30 runs short despite a strong 62 by Lloyd Williams, a knock that would see him promoted to the 1st XI in coming weeks. Ben Jackson’s trio of wickets earlier in the game also put the Bloods right into it. In Round 6, Warrandyte had an almighty batting collapse until tail-ender Steve Lockie would top score and put on 30 odd with Steve Rock to give Warrandyte a total of 75 to defend with the ball. Despite the small total, the impossible looked alive when South Croydon fell to be 5/50, until the total was eventually surpassed. Round 4: Warrandyte 8/109 (S Bowyer 26, Lee 25) def. by South Croydon 3/113 (Lee 2/22). Round 5: Warrandyte 172 (Williams 62) def. by Heathmont Baptists 8/204 (B Jackson 3/39). The 3rd XI sits just outside the top four in the Don Smith Shield, a respectable effort in such a competitive grade. Warrandyte have put together a good couple of wins thanks to some reliable batting by captain Cameron Day and all-rounder Brandon Stafford, both really clicking with the bat and ball. Having played away all season, it wasn’t until Round 6 that Warrandyte would play their first game at their new home at Warrandyte High School, and would fall just short of a very strong total posted by Scoresby. Round 4: Warrandyte 8/141 (Day 44, Stafford 30) def. Scoresby 2/148. Round 5: Warrandyte 8/228 (Day 93) def. Montrose 8/218 (Ison 3/48). Round 6: Warrandyte 200 (Haworth 73) def. by Scoresby 268 (Huntly 4/81, Reardon 3/76). The 4th XI sit third, with three wins and two losses for the season, but have a game up their sleeve as they head into December. Skipper Nathan Croft has ensured they took points in November against St Andrews, helped by veteran all rounder Mick Spence, and a couple of forfeits by Scoresby. Round 4: Warrandyte def. Scoresby via forfeit. Round 5: St Andrews 88 (Spence 3/7) def. by Warrandyte 3/101 (Spence 28n.o.). Round 6: Warrandyte def. Scoresby via forfeit. The 5th XI are just two points shy of the top of the table in the John Macmillan Shield, benefiting from the leadership of their new co-captains. Playing a mixture of seniors and juniors, the mixed format of cricket has become a real treat to watch. Chris Jackson ensured the team would win their Round 4 game, with Drew El Moussali supporting well with the ball. In their Round 6 game, Warrandyte dominated Ainslie Park, with Chris Jackson starting the party with the bat, before Sean Dixon put the opposition to sleep, monstering 100 off eleven overs to ensure the game would be Warrandyte’s (see below). Round 4: Warrandyte 7/221 (C Jackson 52n.o., Molyneux 52n.o.) def. Ainslie Park 136 (C Jackson 4/23, El Moussali 2/6). Round 5: Warrandyte 7/230 (Bansal 55n.o., Trayford 49n.o.) def. by Wantirna 242 (C Lawson 3/17, El Moussalli 3/20). Round 6: Warrandyte 6/282 (C Jackson 53, S Dixon 100n.o.) def. Ainslie Park 9/266 (Hanson 3/9). Bill Stubbs has his 6th XI working well together, sitting atop the ladder at the end of November. Due to some kinks in the fixture, Warrandyte faced Bayswater Park three times in a row, with Warrandyte winning all games. Despite the same opposition, Warrandyte were consistent and versatile through all three ties, with different batters and bowlers ensuring the side stayed perfect for the month. Round 4: Warrandyte 4/127 (Dixon 34) def. Bayswater Park 122 (A Ramsdale 4/16). Round 5: Warrandyte 5/145 (G Warren 51n.o.) def. Bayswater Park 5th XI 9/108 (Rees 3/20). Round 6: Warrandyte 4/297 (T Jackson 101, J Stubbs 49) def. Bayswater Park 78 (B Stubbs 4/25, J Weatherley 3/4). 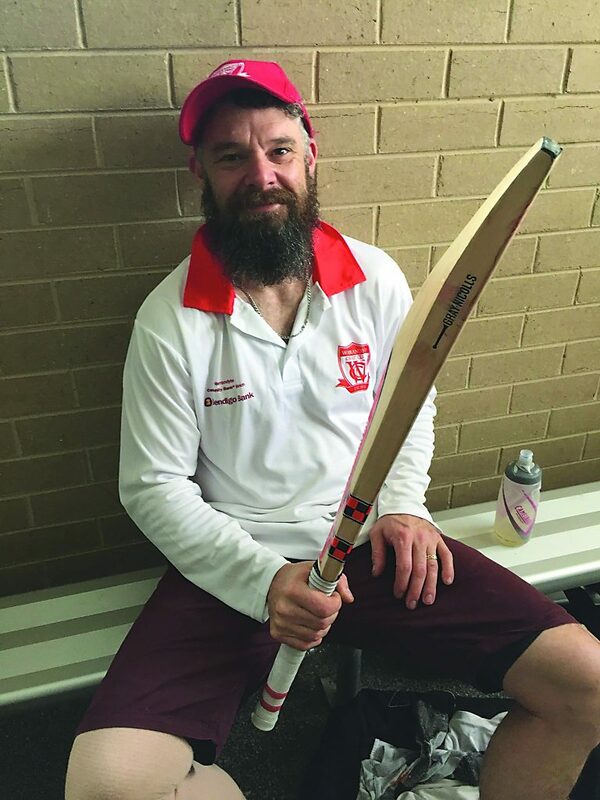 LOCAL Warrandyte cricketer Sean Dixon has made waves with an astounding knock, that will remain in the minds of fans and spectators for years to come. 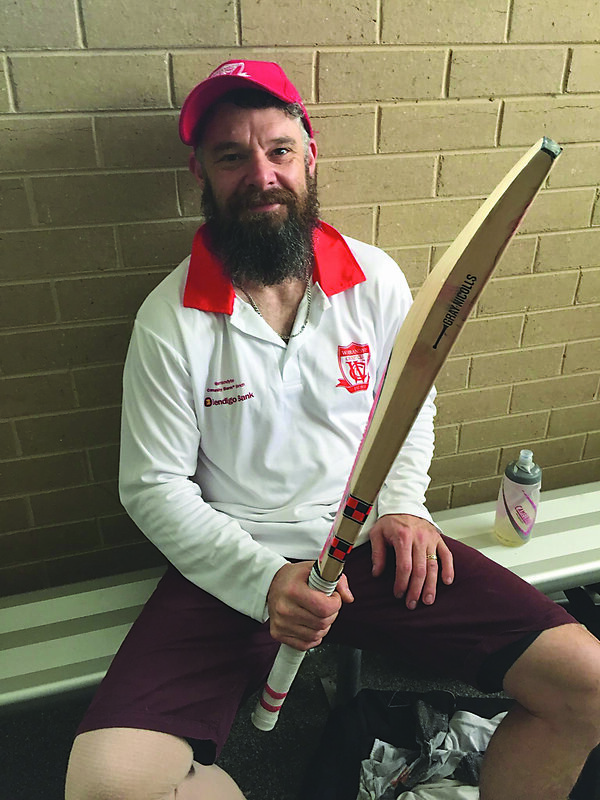 Dixon, who has most recently been playing for the clubs veterans team in the Over 40’s squad, made his mark in the Seniors division as well, with a scorching 100 not out off just 39 balls. The century, recorded against Ainslie Park in a 5th XI fixture on November 18, powered the club through to an impressive victory. Dixon’s knock at Griff Hunt Reserve is even more remarkable when analysed; he had 14 dot balls, effectively meaning he made the 100 off just 25 deliveries. Dixon arrived at the crease in the 17th over and was retired by the 28th, after hitting nine sixes and ten fours for his innings. ‘TIS THE SEASON to be Jolly… But how often do we really feel that way during the festive season? I would feel more jolly if the whole thing was a little less excessive! Most jollies are felt when getting excessively merry at a social gathering, or that special feeling of unbuttoning your pants after over-indulging on a ridiculous amount of food at the Christmas table. These states would better be described as drunk and bloated, but for some reason, “jolly” seems to make these behaviours acceptable at this time of year. I propose we rename the day to what it has actually become… Excess-mas. Let’s be honest, the number of people who celebrate this day based on the birth of Christ is declining. What has the day become about instead? If you’re a kid, it’s about Father Christmas, and what presents you’ll get from whom. If you’re not a kid (or you’ve been naughty), then it’s about the gifts you must get for others, the maximum volume of food and drink you can possibly buy, prepare and consume, and how you should participate in all the other traditional rituals… the symbols of which have mostly become quite materialistic. Take for example the act of buying a Christmas tree. There is a tradition of cutting a baby pine tree down, thus killing it, so we can put it inside for a couple of weeks during December. Some buy a plastic one to avoid the mess or allergies, and hopefully reuse it year-on-year. And then we decorate it, usually with disposable plastic ticky-tack bling, which we often want to replace the following year. Decorating the house is something that can quite a joy, but so many people seem to go right over the top, running excessive strings of lights and/or inflatable Santa’s and so on. For those hosting their family on the big day, so much fuss goes into the house being just so; the table must be a work of art fit for Mr and Mrs Claus themselves to sit at, there cannot be a blade of grass out of place, and the massive amounts of food being prepared has to be exactly perfect. Then there is the buying of gifts, which seems to be something often done through obligation, rather than love. I remember when the art of gift-giving was valued, and people took time to think about what their friends and family members might enjoy or be able to use. It’s now the trend to “just get them a voucher, so they can choose”, thus avoiding having to make a decision, or risk making the wrong one. Kris Kringle must surely have been conceived by either a Communist or an accountant, overwhelmed by the excessive number of gifts they felt obliged to buy. This logically constructed system efficiently simplifies the task of gift giving, but it leaves a lot to be desired in terms of sharing love and respecting personal connections. I’m Dreaming of a Green Christmas! I have a few ideas to help us be a little lighter on the planet this festive season, and to get back in touch with the festive spirit. I’m certainly not aiming to take the fun away, rather lets contemplate what might happen if we started doing things a little bit differently. How about if we all used living Christmas trees in pots (preferably natives), and planted them after we’re done. Consider if we gifted only second-hand or hand-created items, or at least had a “no plastic packaging” rule amongst the family. Imagine we took the time to create personalised cards (perhaps with our own art or a meaningful photo) with some thoughtfully chosen words, to empower all of our loved ones for the coming year. For the person that has it all, or really is “impossible to buy for” could we buy something for a less privileged person on the other side of the world instead? I’m imagining gifting my mother with a card, showing that her gift is going to provide an education to a girl in Africa, or similar. How about creating beautiful unique looking gifts, wrapped in recycled paper or newspaper, with glamorous and/or functional ribbon / rope / dried flowers etc to decorate them. Could you get by with less dead animals on your table? Perhaps one type of meat is enough. Much of what is special about Christmas is tied to traditions. It’s important to respect and honour traditions that bring us together, and it’s also healthy to move on from bad habits which no longer serve us. We don’t want to end up looking like the bulging hairy man in red, carrying around a heavy bag of “stuff”! So Come All ye Faithful, lets enjoy the 12 Days of Christmas in moderation, and bring Joy to the World, with a Silent Night or two Away in a Manger, to keep calm and preserve peace on Earth. CHRISTMAS just came early for more than 55 community groups in Warrandyte and surrounding areas. They all received a share of $400,000 in grants and sponsorships thanks to the Warrandyte Community Bank’s Community Investment Program, which sees up to 80% of its profit returned directly to our community. To celebrate, the bank held its Annual General Meeting and Grants Presentation with more than 100 volunteers and community leaders on November 13 at the Warrandyte Sporting Group clubrooms. Staff and Directors heard first-hand how grant funds will be spent over the coming year. Aaron Farr, Chairman of Warrandyte Community Financial Services, the company which operates the Warrandyte Community Bank Branch, said the grants would be used to carry out improvements to local infrastructure, resources and projects which will benefit the entire community. “This year’s grants ranged from $850 to more than $56,000; $400,000 has been committed for the year, with $2.8 million reinvested in the community since we opened in 2003. “It is really rewarding to see the Warrandyte clubrooms full of people, many volunteers who work hard with the greater good of their community at heart and all benefitting because the community banking model ensures funding is directed at a local level,” he said. Grant recipients include local CFA’s, environmental and arts groups, schools, kinders, sporting groups, community services and church groups. The Park Orchards Pettet Family Foundation gratefully accepted sponsorship of $5,000 to support its work in the local community — the Foundation provides crisis intervention for children and their families. Foundation Director Graham Whiteside said: “we are continually striving in our efforts to increase our reach and are consciously expanding our horizons when caring for those in need in our community. Veronica Holland told guests what Christmas Hills Fire Brigade will be doing with its grant of $16,995, which will ensure the replacement of the brigade’s manual bi-fold door. Operation of the existing door is slow and arduous, it can take up to 20 minutes to be opened, requires two personnel and the brigade’s Tanker can barely pass under safely. “The bi-fold door on the south station is old, warped, pernickety and tired, much like many of the firefighters,” said Veronica. She went on to say “getting an automated push button magical door is going to make us all very very happy”. Sports Chaplaincy Australia (SCA) was awarded the banks’ inaugural Strengthening the Community Philanthropic Award. Warrandyte Community Bank Director Lance Ward made the surprise presentation sharing his thoughts on the significant impact of sports chaplains and how in times of crisis our young people need options to turn to that might not be their mum and dad, medical professionals or their teachers. “It’s so important for young people to have someone to talk with when times get tough. “The chaplains from SCA work alongside the young people in our sporting clubs and are making a genuine and far reaching impact in the everyday; that is, when things are going well and in times of need, this is both unique and special. 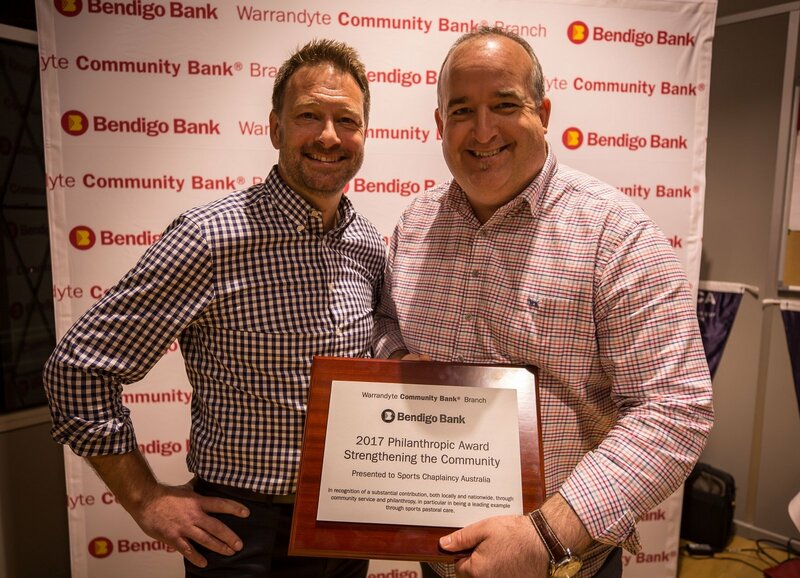 “On behalf of the Warrandyte Community Bank, the Directors and Chair Aaron Farr, we want to say thank you to the men and women of SCA for serving so selflessly in our local community,” Lance said. The presentation night was showered with stories of change, hope and inspiration and on the back of a national Bendigo Community Bank “BE THE CHANGE” ad campaign, where customers are asked if they would like to see what difference their support makes. In a sum up of the night, you may not think who you bank with matters — but it does, and for Warrandyte Community Bank customers their banking is making a real difference. Every day customers help provide facilities, resources, community programs and change lives simply by banking with our local branch. Their home loans are refurbishing pre-schools and supporting our CFAs, creating sporting facilities and providing classroom resources. Personal loans, business banking and credit cards are funding rescue boats, conserving and rehabilitating native bushland, supporting the arts, festivals, Christmas Carols, the aged and relieving the hardships of those in need. Everyday banking is providing all this and more. In fact, $183 million has been returned to communities and initiatives Australia-wide via the community bank network. Do you need a bank to give you the products and services you need? Warrandyte Community Bank provides a full suite of banking products at competitive rates. You can make a real difference in your community simply by banking locally. To find out more contact Cheryl and the team at 144 Yarra St, Warrandyte or phone 9844 2233. THE MUSIC industries finest gathered in Melbourne during Melbourne Music Week for The Age Music Victoria Awards. Melbourne soul tastemaker and RRR host Chris Gill and PBS presenter Lyndelle Wilkinson hosted the 2017 Awards acknowledging the best acts, releases, venues and festivals throughout the State. This year’s awards saw some familiar faces gracing the prize-winners’ stage on multiple occasions as well as some first-time awardees, in what was an absolute standout celebration of the past 12 months of great local music. Warrandyte’s favourite son’s The Teskey Brothers took out this year’s Best Emerging Act. A previous winner of the award Remi was up for Best Male Artist this year but was edged out by perennial favourite and music legend Paul Kelly, so we hope to see the Teskey Brothers continue to go from strength to strength on the back of this prestigious award. Frontman, Josh Teskey told the Diary that they are blown away by the amazing year they have had. “From being a band from Warrandyte, that in our 10 years of playing together had never left Victoria, we’ve been fortunate enough to be able to travel our music all around the country and overseas to the States and London. “Our album Half Mile Harvest has had a much bigger reach than we ever could have imagined,” he said. Music Victoria CEO Patrick Donovan commented on this year’s impressive talent as he congratulated all of the winners and nominees. “We are very proud that many of these winners haven’t just made an impact in Australia over the last 12 months, but acts such as Jen Cloher, The Teskey Brothers, King Gizzard & The Lizard Wizard and A.B. Original have been flying the Victorian flag overseas,” he said. To top off what has been such an incredible year for the Teskey Brothers, Half Mile Harvest was also awarded best soul/funk album. Josh Teskey said the award was “the icing on the cake”. “We’re so humbled people have responded to this album with such love, and avid thanks to Vic Music for everything they do for this thriving Melbourne music scene,” he said. Major sponsor for the night was The Age, and Editor of the paper’s EG, Martin Boulton said “In our 12th year, it’s perhaps more satisfying than ever to see our genre award winners also making a name for themselves nationally and overseas. “The huge array of talent nominated this year speaks volumes about the health of our local music industry,” he said. Following the awards verdicts as per tradition, the festivities continued into the night with the official Awards After Party featuring killer live performances from minimalist disco act Harvey Sutherland and Bermuda, powerhouse trio Cable Ties and post-punk four-piece Gold Class. Party starters the EG Allstars Band also backed some special guest performances from Josh Teskey (The Teskey Brothers), Archie Roach, Gretta Ray, Ella Thompson (GL), Michelle Nicolle, Birdz, Mojo Juju and Jim Lawrie performing some of the best songs of the year. It was a big month for the local lads, as they also supported Australian music legends Midnight Oil for one of their sold-out performances at the Myer Music Bowl. The boys are busy continuing with their tour around Australia and New Zealand, but if you are lucky, you can catch them on a brief visit back home on January 26 for a special twilight performance at Melbourne Zoo. WARRANDYTE CFA’s youth crew are celebrating 20 years of firefighting and fun. Beginning in the 1990’s as a Year 9 and 10 program at Warrandyte High School, the youth crew started as a practical elective for students wanting an outdoor and hands on experience. Over the 20 years, more than 880 students have experienced the program, with dozens going on to volunteer and work with the CFA. Those that walk through the youth crew’s doors have come out the other end as resilient and community minded young adults, pursuing careers as paramedics, career firefighters or in fields like engineering. Will Hodgson, an instructor for the youth crew and First Lieutenant at the Warrandyte CFA, says the program provides a unique experience for students, especially those that may not want to follow traditional academic routes. “The world has lots of things to offer — It doesn’t matter how well you’re doing in maths or science… with the CFA program you’ve got life skills, first aid skills and they’re working within their communities. “The impact this has… everyone has helped out in the community; I feel so humbled to know that we’ve touched the lives of young people so that they can carry the CFA values throughout their lives and make change in their communities,” he said. 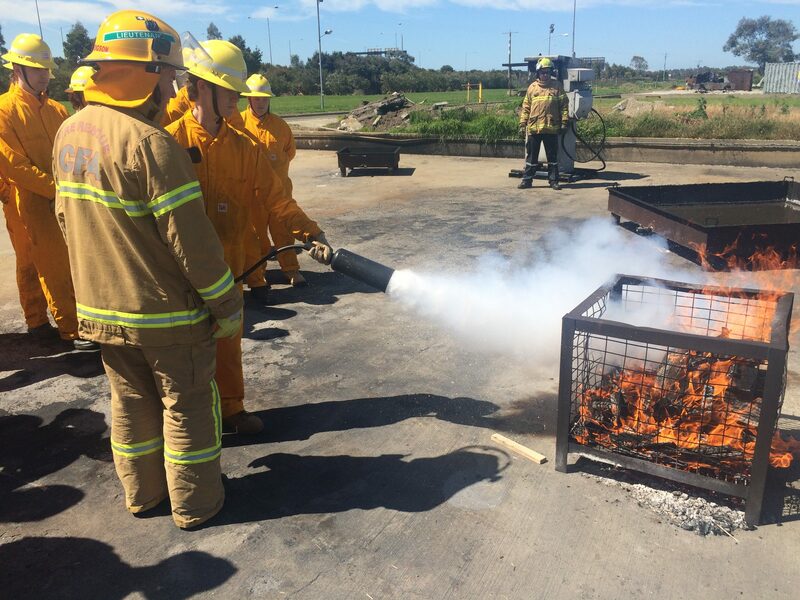 The program includes trips to the CFA and MFB headquarters, an excursion to the fire museum, fire fighting camps and outdoor education activities. Students learn how to use and respect the equipment and fight fires first hand. Dave Kahuaiwa from Warrandyte High School cannot believe how the program has evolved and succeeded. “They arrive as a jumble of kids, and they leave with really great leadership skills and team skills — they go home and have a conversation with their families about fire preparedness and fire plans. “What better community group to be a part of in Warrandyte than the CFA? Because of where we’re situated, it’s so important.,” said Dave. Will Hodgson says the impact the youth crew has in kids’ lives is profound, and it is an experience he is incredibly grateful to be a part of. “Students need to know that they’re worthwhile, and this program gives them the opportunity to be free from academic pressures for a while.